For Sakyong Mipham, the challenge was running on a bloody, 4-1/2 inch blister that had developed on one of his feet. For me, it was the ITB injury. For both of us, the marathon was the Toronto Waterfront. Of course, as a Tibetan lama who has devoted his life to the practice of meditation, he handled the situation a heck of a lot better than I did. Where my mind imploded and my spirit broke, he did not “let the pain steal [his] mind.” Instead, he writes, “I paid attention to the feeling of my pain, but I did not let it dominate my mental space. This was a delicate balance: I did not want to ignore the pain, so I stayed with it, and at the same time … I focused on my good fortune to be in good enough shape that I could run a marathon” (54). To find out how he succeeded where I failed was all the incentive I needed to read Running with the Mind of Meditation. 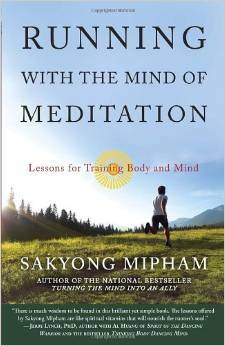 Essentially, the book attempts to parallel the stages of meditation training with the stages of long-distance training. For Mipham, both begin with building a base–strengthening the body and mind so they are ready for the challenges ahead. From there, would-be runners and meditators must learn the delicate balance between pushing themselves enough to progress while not pushing so hard that they will do damage to themselves and, worse, give up in despair. Once each group acquires the good habits needed to make either activity central to their lives, they can reap the physical and spiritual rewards that each offers. Mipham divides running and meditation training into four phases: tiger, lion, garuda (a mythical Tibetan creature/god that is half man, half bird) and dragon. The first two phases will seem familiar enough to most runners who have taken the time to reflect on running and themselves. The second two phases, as their mythical namesakes suggest, are more mystical and, perhaps, less attainable or understandable to most of us, even those who, like myself, have a more spiritual outlook on the world. The first, or tiger stage, involves learning to run with the correct form and technique. In so-called “tiger runs,” we concentrate on posture, on our core and our footstrike. We learn to breathe, and we harness the power of positive thinking. The key concepts for this stage are gentleness and mindfulness. From the beginning, we must learn to be friendly and kind to ourselves, using humor to keep “our mind from being critical or getting into other extreme states” (85). And we must run “mindfully” and “wholeheartedly,” running in the moment with focus, attuned to everything involved in the run. Next comes the lion stage, where we begin to experience joy, not through achievements but through the hard work and discipline that has brought us to this point. “The happiness that we experience is not coming out of nowhere,” writes Mipham. “It is the result of physical discipline and mental exertion. Therefore happiness is not a goal but a by-product of mentally and physically healthy activities” (123). In the next, or garuda stage, we begin to run for the love of it, not because we want to get fit or because we want to run a race to say that we did it. We engage in new challenges to keep things fresh and spontaneous, all the time applying the intelligence we have acquired along the way. The stage is marked by “balance and freedom … from hoping that something will happen and fear that it will not” (140). That balance, or clarity, is the root of Mipham’s definition of the elusive “runner’s high”: “the contentment of the tiger, the delight of the lion and the freedom and balance of the garuda” (155). From here, we move into the final dragon stage. “For runners and meditators,” Mipham writes, “the dragon represents the mysterious phase in which we develop a level of insight that allows us to connect with our deep inner wishes and aspirations” (170). And when tiger, lion, garuda and dragon all come together, the result is harmony of mind and body. The Tibetan term is lungta or windhorse, where “the wind represents the complete awakenment [sic] of the human mind [and] the horse represents expedience, success, and swiftness” (194). From that harmony comes confidence and positivity which, in turn, enables us to have a positive effect on all around us and, ultimately, the world. By this point, I suspect, Mipham goes well beyond a place where all but the most advanced practitioners of running or meditation will ever need to go. Discussions of dualistic and transcendent minds, for example, won’t mean much to the those of us who are trying to lose some weight, run our first 5K or PR our next marathon. But there is much here to inspire us and ponder on our next long run. The great strength of the book lies in its articulation of the phases we go through as runners rather than mapping out a prescriptive program. If you have received no coaching, or have had little contact with experienced runners, as is my case, then Running With the Mind of Meditation can help you understand the emotional and mental components of what we do. This is not a training manual in the traditional sense of the word; rather, it seeks to add a new and greater depth to running by helping to define it in terms other than the traditional binary of success or failure. This entry was posted in The Flat-Footed Fox and tagged fitness, long-distance running, marathon training, running, running injury, Running with the Mind of Meditation, spirituality, Toronto Waterfront Marathon, training. Bookmark the permalink.